Someone who knows Ronnie, one of his mates, said we'd get on? One night, many years ago in the Grove and this, about Truthscoop-type talk. And manner-about -- I trust. Thereon, should bet, Ronnie wouldn't read this site and snigger. Well, he would of course, but you know what I mean. Wouldn't pretend-misunderstand-get/all-scardy-turn-away... act, detached, go shushh, be QT. Like typical folk, normies, including those who know a bit but prefer to say/do: Nuoto. "THE ROCKET IS IN THE FINAL AGAIN" Saturday. On Sunday, Ronnie O'Sullivan's Century Break #991 a joy to see but fair do's and the man who won the match. Judd Trump, like Ronnie... what a name. Massive respect to Ding and for Ronnie and "no it's just between me and Ding... you know interview". 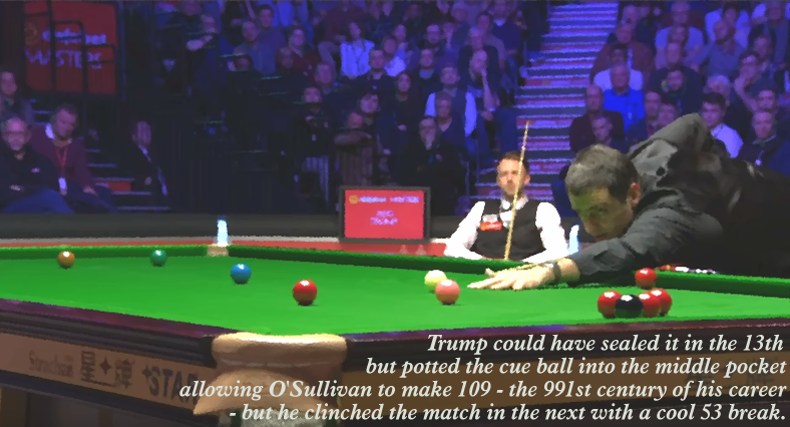 BBC: Needing to make an extraordinary comeback, O'Sullivan was raucously cheered on by the partisan London crowd and made the ideal start by taking the first frame of the evening session, but Trump made 88 and 68 to move a frame from victory. Please watch #989. Sport to relax in. Think up while deep in the wait and moves. Most all else? Stay away from. Share the odd horse race with someone, big races. Otherwise, no. Might, do chess. Like the commentary across the lot. This or that got me live for some hours. Time to push. Sound thought? : Ronnie comes across as a right good one. Not superstitious -or- religious, he mentions. Alright by me, depending on what we mean by the last word but, be my answer. Reminds me of KINDNESS. Snooker and Ronnie.